You are here: Home / nutrition / Are Tanning Beds Safe? Karen and I get plenty of sunshine when we flee the brutal winters of Michigan and head south like thousands of other snowbirds. Since we have access to the sunshine almost every day we spend there, the thought of lying on a tanning bed is obviously not very appealing but there are some serious ramifications that should be considered when making the decision to use a tanning bed. Here are both sides. I am also providing you with plenty of references so you can research this on your own and decide for yourself. The Food and Drug Administration says that about 30 million Americans use indoor tanning beds each year, including 2.3 million teens. More than 35% of American adults report ever using a tanning bed, along with 59% of college students and 17% of teens in the analysis. Since 1992, U.S. rates of melanoma have increased by 3% a year in white women ages 15 to 39, (American Cancer Society). People who use a tanning salon before age 35 increase their risk of melanoma by 75%, according to the Centers for Disease Control and Prevention. Higher melanoma rates among young females compared to young males may be due in part to widespread use of indoor tanning among females. UV devices are commonly referred to as “tanning” beds. The FTC is clearly not separating the significant difference between a high-pressure UVA light device purposely made to darken skin versus the use of UV lamps designed for nutritional purposes. I am part of the scientific community convinced by extensive evidence that limited and controlled UV exposure, ideally from the sun but also if need-be from the limited and controlled use of a sun bed, is crucial to a healthy life. It makes even less sense when you consider that even sun avoiders develop melanoma — the deadliest form of skin cancer. Not only is your risk of developing melanoma from sun exposure exceedingly small — well below 1% — but your risk of developing melanoma does NOT disappear by avoiding sun exposure. It’s just one-tenth of 1 percent lower than if you did get frequent exposure. A number of authorities, including the National Institutes of Health (NIH), have shown UV light helps promote vitamin D production and deliver other health benefits, including improved cardiovascular health and a reduced risk of 16 different types of cancer, including breast cancer. So there you have it. Research for yourself the pros and cons. Always be careful to not burn your skin under the sun or the tanning bed. Put on plenty of organic SPF tanning lotion. Seven years ago I lost my cousin (and a very close friend) to melanoma when she was only 38 years old… and guess what?… she NEVER used a tanning bed. I personally avoid tanning beds altogether in favor of REAL sun, but when I’m at home during the winter months I simply do NOT get enough Vitamin D (like most of the population who lives in colder climates) so I keep a sunlamp next to my desk and turn it on a few times per day. If you like the look of having a tan, I personally think it’s a much smarter just to get a toxin free spray tan. Always make sure to use common sense and make an educated decision on what’s best for YOU. Stay fit and keep learning new things. 1 Guy GP, Berkowitz Z, Holman D and Hartman A. Recent Changes in the Prevalence and Factors Associated With Frequency of Indoor Tanning Among U.S. Adults. JAMA Dermatol 2015; Published online July 1, 2015. 3 Friden TR, Jaffe HW, Cono J et al. Youth Risk Behavior Surveillance — United States, 2013. MMWR 2014; 63 (4): 42. 4 Guy GP et al. Trends in Indoor Tanning Among US High School Students, 2009-2013. JAMA Dermatol. 2015; 151(4): 448-450. doi:10.1001/jamadermatol.2014.4677. 5 Howlader N, Noone AM, Krapcho M, Garshell J, Miller D, Alterkruse SF, et al (eds). SEER Cancer Statistics Review, 1975-2012, National Cancer Institute. Bethesda, MD, http://seer.cancer.gov/csr/1975_2012/, based on November 2014 SEER data submission, posted to the SEER website, April 2015. 6 Choi, K., Lazovich, D., Southwell, B., Forster, J., Rolnick, S. J., and Jackson, J. Prevalence and characteristics of indoor tanning use among men and women in the United States. Archives of Dermatology, Vol. 146 2010, No. 12, pp. 1356-61. 7 “Tanning Salons in the US: 81219c.” IBIS World Industry Report. 2009 August 7. 8 Hornung RL, Magee KH, Lee WJ, Hansen LA, Hsieh YC. Tanning facility use: are we exceeding the Food and Drug Administration limits? J AM Acad Dermatol. 2003 Oct;49(4):655-61. 9 Miller, SA, Hamilton, SL, Wester, UG, Cyr, WH. An analysis of UVA emissions from sunlamps and the potential importance for melanoma.Photochem Photobiol 68(1998), 63-70. 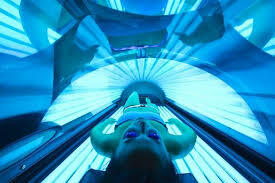 10 The International Agency for Research on Cancer Working Group on artificial ultraviolet (UV) light and skin cancer “The association of use of sunbeds with cutaneous malignant melanoma and other skin cancers: A systematic review.” International Journal of Cancer. 2007 March 1;120:111-1122. 11 Karagas M, et al. “Use of tanning devices and risk of basal cell and squamous cell skin cancers.” Journal of the National Cancer Institute. 2002 February 6;94(3):224-6. 12 Wehner MR, Shive ML, Chren MM, Han J, Qureshi AA, Linos E. Indoor tanning and non-melanoma skin cancer: systematic review and meta-analysis. BMJ. 2012 Oct 2;345:e5909.